Texas Health Forth Worth (“THFW”) wanted to improve physician engagement and satisfaction, as well as grow surgical volume, without increasing the number of rooms running. Leadership identified the need to unlock more capacity, incorporate more input from surgeons to guide the strategic direction of the OR as well as drive improvements in OR operations. Multidisciplinary team redesigned and implemented optimized block schedule based on national best practices and THFW’s historical data. Integrated physicians into block policy design, process improvement efforts, and governance structures through data analysis, best practice sharing, surgeon interaction, and administrative guidance. Developed a thorough approach to engage the surgeon community and their offices. Reimagined THFW’s governance structure to focus on transparency and physician engagement; dedicated separate committees to drive block management and operational improvements. Provided consistent communication of project progress to all stakeholders through weekly updates, surgeon office visits, and 1:1 physician meetings. 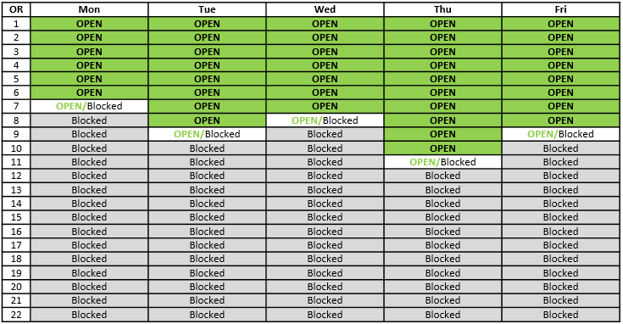 Improved from 99 open hours (<10% open) to 524 open hours (36% open). Doubled the number of available first case starts by creating full-day blocks and right-sizing allocations--a key recruiting tool for new surgeons. GrowthPerformed more cases year-over- year as well as 20% more orthopedics cases in first two months after block go-live. The majority of other service lines also experienced growth.